Save 10% on your first purchase. Enter coupon code: SAVE10 during checkout! Lightweight, Jiffylite® bubble mailers are a cost-effective way to protect your merchandise against damage and shock. 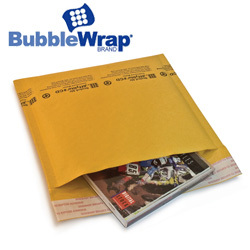 Bubble mailers require less postage than boxes, and their durable kraft paper construction and 1/8” Bubble Wrap® lining give your mailings exceptional protection that can withstand harsh handling. Plus, our bubble mailers are self-sealing which not only saves valuable insertion and fastening time, but also offers important tampering security. To start shopping for Jiffylite® bubble mailers, click on our products above. We ship all orders within 24 hours of purchase (weekends/holidays excluded) and each item comes with a 100% guarantee. If you're not completely satisfied with your order you may return it within 10 days of receipt for a cash refund or replacement (less shipping). Copyright © 2011 Shipping Supply, LLC. All Rights Reserved.